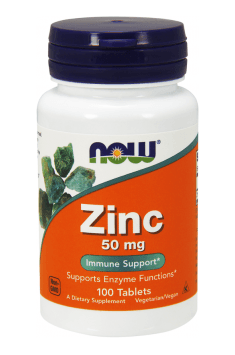 Now Foods Zinc is a dietary supplement containing 50 mg of zinc in one dose in the form of zinc gluconate. Zinc is an essential microelement, which influences many biochemical processes in the organism, conditioning its proper functioning. Zinc plays structural, regulative and catalytic roles in the organism. Being the component of active centers of many enzymes, it regulates metabolism of building ingredients, energy processes and the functioning of the hormonal system. It conditions proper activity of i.a. the immune, reproductive and nervous systems. The highest concentration of zinc is observed in the brain, where it plays modulator functions. Zinc ions are located in glutaminergic neurons in the area of presynaptic ends and are released to the synaptic space under the influence of stimulation, enabling transmitting the signals to subsequent neurons. Glutaminergic neurons are present in cerebral cortex and in the limbic system. They condition i.a. the processes of learning and memorizing and the reception of sensory impact. Additionally, zinc causes sensitizing synapses to the activity of neurotransmitters. Zinc regulates the expression of genes of metallothionein. Metallothionein (MT) is a family of low molecular proteins, binding toxic heavy metals (i.a. bismuth, cadmium, silver) and they demonstrate strong antioxidant effect, counteracting damages induced by free radicals. Metallothioneins are present i.a. in the liver, intestines and kidneys. It was proven that increased supply of zinc causes the growth of the level of zinc metallothionein in the organism, due to the fact of inducing the expression of genes of these proteins by zinc. This microelement plays a role in all stages of the cellular cycle, regulation of gene expression and the synthesis of the genetic material. Zinc improves sensitivity of cells to insulin. It is stored in the complex with insulin in β cells of the pancreas. Along with the secretion of insulin, in response to the growth of the concentration of glucose in blood, zinc is also secreted. It was proven that the drop of secretion and activity of insulin is related to zinc deficiencies. Insufficient supply of zinc consequently causes the increase ot the organism’s tolerance to glucose and unbeneficial changes of the hormonal balance. Zinc is an important element of the antioxidant system of the organism. It protects cellular structures from oxidative activity of free radicals. It prevents oxidation of sulfhydryl proteins. Zinc also directly influences the activity of antioxidant enzymes, i.a. zinc-copper superoxide dismutase, which protects purine bases in DNA from the harmful activity of superoxides. DNA damages are one of the basic causes of cancer development. Free radical compounds damage endothelium of vessels, casing the growth of permeability of capillaries and the secretion of vasoconstrictive factors. Oxidation processes contribute to the development of civilization diseases, i.a. hypertension or coronary artery disease. Zinc is essential for the optimal functioning of the immune system. It boosts immunity in healthy people and those with disturbed immunity. As a cofactor of thymuline, one of the hormones of thymus, zinc conditions proper maturation of lymphocytes T (thymus-dependent), conditioning cellular immune response. It influences the processes of cell proliferation and apoptosis, stimulates monocytes and promotes the adhesion of neutrophils to the endothelium of blood vessels. Chronic zinc deficiency may lead to thymus atrophy and consequently to weakening cellular and hormonal immunity, limiting the production of anti-inflammatory cytokines and decreasing cell proliferation. It was proven that zinc deficiencies most often appear among the populations of developing countries with high mortality rate. To sum up, Now Foods Zinc is a preparation which effectively complements zinc deficits in the organism. It is especially recommended to people with lower immunity, people who live in a contaminated environment, e.g. in big cities, with skin problems, lower fertility, insulin-resistance and as an element of prophylaxis of civilization diseases. Take one tablet once a day, after breakfast or after dinner. Apart from zinc, deficiency of magnesium also takes part in depression pathogenesis. Magnesium demonstrates synergistic effect with zinc in modulating the functioning of the glutaminergic system. In order to take care of your nervous system, it is worth including the preparation containing magnesium, preferably in the form of organic connections - e.g. citrate or malate.